A young man, wearing a white helmet and a distinctive yellow-and-blue badge on his arm, digs for four hours in the rubble of a building destroyed by a Russian-regime airstrike in Idlib Province in northwest Syria. Warned that Russian warplanes are overhead, volunteers in a civil defence centre get out of their beds and dress, preparing to help victims at the next bombed site. As they arrive, the warplanes target them in a “double tap” attack, dropping one bomb and then another minutes later. One rescuer is seriously wounded. His colleagues wait anxiously, and suddenly he revives, insisting on lighting a cigarette. A sigh of relief as the pack is taken from him: “No smoking for you now. These all-too-numerous episodes often don’t end so well. Generally it’s bodies rather than survivors that get pulled out of the rubble, and the volunteers are vulnerable: 141 have been killed and many more wounded. As Syria’s nearly six-year conflict rumbles on with no end in sight, the country’s so-called "White Helmets” continue to offer a desperately needed humanitarian response. More than 62,000 people have been rescued since the volunteer humanitarian force was formed in 2013. So who are the White Helmets, and how did they come into being? By 2013, the Assad regime was well embarked on its strategy of targeting civilian sites with intense aerial bombardment. The city of Homs had been decimated by months of attacks in early 2012, ensuring that the overstretched Syrian Army could occupy almost all of the area, and the approach was being rolled out across the country. Those who died in opposition areas often lay unburied, while the injured were left to perish. Ad hoc groups of residents tried to cope after the attacks, but they were usually untrained and not organised. James Le Mesurier, a former British Army officer already working as an adviser on Syria civil defence at the UAE-based consultancy Analysis, Research, and Knowledge (ARK), decided to go further and seek the finance and infrastructure for a full-time service. With initial training and courses from ARK and the Turkish NGO AKUT, the first volunteers – starting with a team of 20 people – were soon in the field. Further support came from governments and NGOs in countries such as the US, Britain, and the Netherlands, and the White Helmets were formally organised as Syrian Civil Defense in October 2014. They are all a very diverse and disparate group of individuals, all of whom made individual choices … They all had the choice whether or not they want to pick up gun, to become a refugee – but they’ve all made a choice to instead pick up a stretcher. Even if they are unarmed, the volunteers are a threat to the Assad regime. Damascus’s strategy – now shared by Russia – is not to just to fight rebels on the battlefield, but also to destroy any semblance of organised services and infrastructure in opposition-controlled areas. If water, electricity, schools, and markets can be blown up and cut off, then civilians can be forced to surrender, or at least reduced to powerless, besieged bystanders. The decimation of medical services is central to the strategy, holding a Damocles’ sword of no emergency treatment and everyday care over residents. In defiance of the Geneva conventions, hospitals, clinics, drug warehouses, and blood banks have been systematically targeted, with scores put out of service. White Helmets centres have been regularly attacked over the past year. In April 2016, one set of missile strikes destroyed a centre west of Aleppo city, killing five volunteers and destroying equipment and vehicles. The “double tap” attacks, hoping to kill and maim the rescuers, are now routine. The theme has been eagerly taken up by those who view the Syrian conflict as a conspiracy of American “imperialism”. That the White Helmets receive assistance from the US government’s Agency for International Development – something they have not denied – apparently means they’re American puppets, even though they draw a range of support from around the world. The fundraising support they get from a PR firm somehow proof that they are the vanguard of a proxy war fought by a US military-industrial complex. Blogger Vanessa Beeley has switched her focus from Israel and Gaza to wage a vitriolic campaign against the White Helmets as “first responders for the US and NATO al-Nusra/al-Qaeda forces”. Never mind that the White Helmets explicitly stand against violence and extremism; ignore the absurdity of the idea that the US – which is bombing the jihadists of Jabhat al-Nusra in Syria, and which has been in a misconceived “War on Terror” against al-Qaeda for a decade and a half – is suddenly allied with those groups. 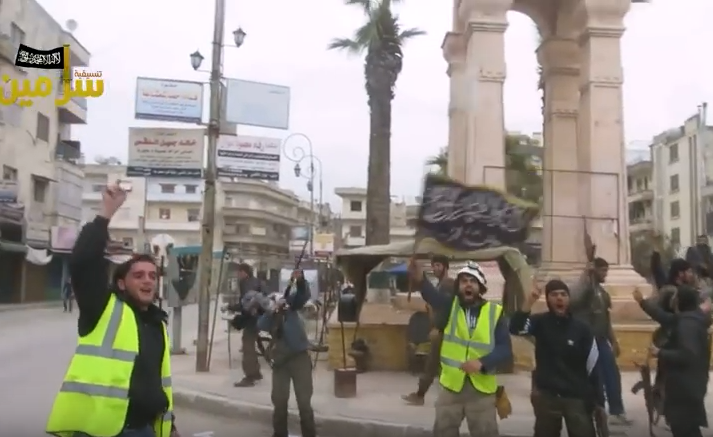 The sight of volunteers celebrating with rebels in the city of Idlib is apparently evidence that the White Helmets are “al-Qaeda”. Max Blumenthal, another writer who has challenged Israeli policies in Palestine, frames the White Helmets as “driven by a pro-interventionist agenda conceived by the Western governments and public relations groups that back them”. Never mind that the White Helmets’ “crime” is to call for zones protecting civilians; ignore their firm declaration that they don’t affiliate with any government or NGO. To Blumenthal, they are a Trojan horse for “70,000 American servicemen” to invade Syria. Having started the cycle of disinformation, Russian state outlets can complete it by citing “investigative journalists” such as Beeley and Blumenthal to deride the White Helmets as a “controversial quasi-humanitarian organisation” and – invoking the magnate George Soros as conspiracy master – a “Soros-sponsored” operation “cooking up lies”. These claims are the product of disinformation and spurious inference – but all this politics and propaganda, however menacing, is irrelevant to the people on the ground, whose focus is on the next mission. We have to have faith that this country is our country. We shouldn’t leave it. If I don’t stand by my country and by my people and those who are oppressed, who will? If I leave and we all leave, there will be no one left. When the bombs rain down, the Syrian Civil Defense rush in. In the most dangerous place on earth these unarmed volunteers risk their lives to help anyone in need regardless of religion or politics. They were ultimately overlooked for this year’s prize, and the propaganda against them keeps coming. But as the offensive in Aleppo ramps up, the White Helmets’ work goes on.